Respecting the spirit of the site, the plantings help restore the land while creating a harmonious transition into the larger landscape. 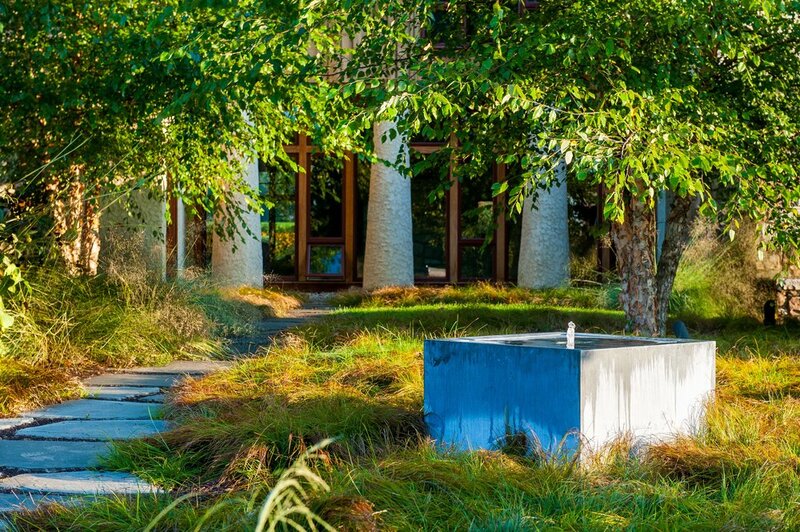 A full, naturalistic palette of grasses and perennials echo the natural landscape while the use of simple indigenous materials, such as dry-laid stone walls, evoke the local character of Chester County. Groupings of deciduous trees to the south of the house facilitate passive solar insulation. Finely tapered earthen ramps evocative of the natural slope to the north of the house provide insulation. Water features in the garden area are tied into the storm water system to minimize possible changes to the hydrology of the site. Every effort was made throughout the project to specify local material and to minimize the use of finite resources.